World number one Novak Djokovic predictably demolished Lucas Pouille in his semi-final 6-0 6-2 6-2 to set up a tantalising Australian Open final with fellow heavyweight Rafael Nadal. 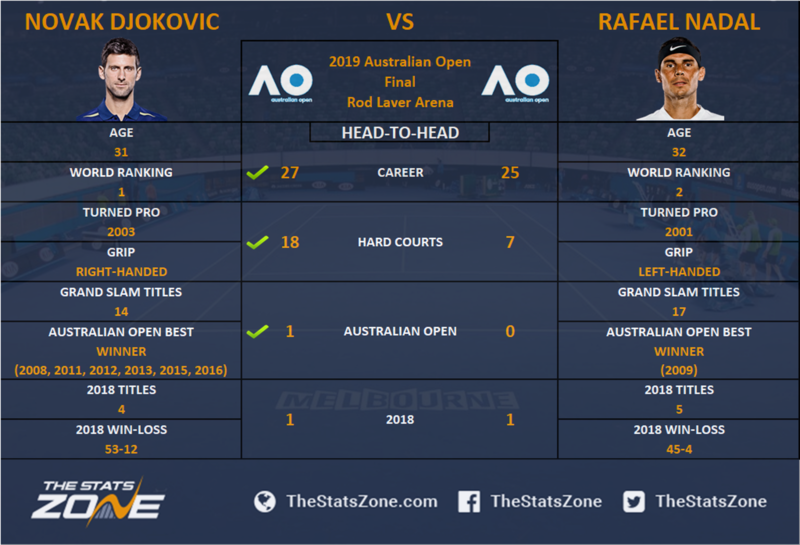 Djokovic is aiming to win his seventh Australian Open, which would surpass the joint-record he shares with Roy Emerson and Roger Federer, and the Serb has never lost a final here. Djokovic has played many scintillating matches with Nadal over the years, and like his head-to-head with other big players, he has a higher win percentage, although it is close at 52% (27-25). Rafael Nadal also dominated his semi-final against much tougher opposition in young Stefanos Tsitsipas, and the Spaniard hasn’t dropped a set in his route to yet another blockbuster meeting with Novak Djokovic. It took a 10-8 final set to separate the two in last year’s Wimbledon semi-final, in a five hour and 15 minutes marathon match where Nadal equalised twice before finally falling to the eventual overall winner. Nadal is in stupendous form, and his slight win ratio deficit with Djokovic, with 25 wins to the Serb’s 27, will matter little to him coming into this. However, of the 25 of those matches played on a hard surface, Nadal has won only seven times. The world number one meets the world number two in this Australian Open final that truly pits the two players in this tournament who have been a cut above the rest of the competition. If their semi-final match at Wimbledon 2018 is anything to go by, this could be yet another classic. The match-up between Djokovic and Nadal is so compelling, and so close (27-25), because between them they hold all the tools in starkly different styles. Djokovic is widely regarded the best returner and defensive player the game has ever seen, while Nadal is perhaps the best tactician, although the hard surface here is truly the Serb’s home turf. You do not want to pick a winner between these true elite performers, but with so much riding on this for Djokovic – his own piece of history like Nadal’s insurmountable record at Roland Garros – you can be forgiven for thinking there is more for the Serb to fight for here. DJOKOVIC IN FIVE SETS.